The Audi A3 Sportback e-tron has a 1.4-liter turbocharged engine and electric motor that offer a combined 204 hp and 258 lb ft of torque. Standard features such as leather upholstery and panoramic sunroof are complemented by a comprehensive list of safety equipment such as driver braking assist and collision avoidance. An 83 mpg potential and class-leading performance and interior quality are offset by a less than spacious interior and limited EV range. As we have seen from the future automobile tech on display at the CES in January, Artificial Intelligence is already present in automobile infotainment systems while the march towards electric cars and autonomous driving continues apace. On the alternative fuels front, Toyota and Mercedes have acknowledged the reality that the existing global electrical grid infrastructure simply cannot support a mass move towards electric cars. Thus, these two automotive giants are also hedging their bets with Hydrogen F-Cell models developed in parallel with their electric vehicles, and the first production cars will go on sale before year’s end. Meanwhile, Audi has developed some great alternative power solutions including fuelling combustion engines from the gases realized by biomass. This has the added advantage of controlling some aspects of rubbish disposal while creating an environmentally friendly use for one of its by-products. Audi is certainly far down the road with their own electrification programme, which goes by the evocative ‘e-tron’ name, which for many instantly conjures up images of ‘Tron’ the famous 1982 sci-fi movie. The first production e-tron vehicle will be a Q5 sized SUV, a natural choice given the popularity of this vehicle genre across the globe. 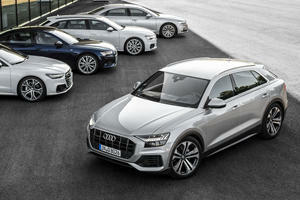 It will be rolled out in production form at the end of this year, and to build up excitement and momentum towards its impending arrival date Audi has embarked on a tiered media event strategy for the intervening months. The first of these events took place in Copenhagen with camouflaged e-tron pre-production cars, with the focus of this first ride experience being the cars bespoke interior and infotainment system. Before taking to the streets we were given a virtual demonstration of what to expect in the new cabin using the interactive 3D wireframe model and VR glasses whose head-tracking feature allowed us to click on specific areas for more detailed information. This simulation also enabled us to ‘examine’ the e-tron’s audio system in detail. Audi interior designer Thomas Pinet presented the e-tron cabin in a most convincingly way with impressive multi-media support on stage at the Royal Danish Playhouse in Copenhagen. The new best thing that Pinet describes as “wrap-around” sets these newly familiar elements up against a cascading dashboard reminiscent of a miniature theatre stage. Presenting the new Audi e-tron via the back door and onto center stage made this seem like a full-size extension of that concept. It must be said though that he did not actually start off with a sheet of white paper here as. Some of the ideas, such as the rationalized transmission tunnel and resulting airy center console, along with the two MMI touch response displays and the virtual instrument cluster, are already familiar elements in the cabin designs of the new A6, A7 Sportback, and A8. The moment we took the driver's seat of the Audi e-tron on the hallowed stage any skepticism about the low-mounted virtual rear-view mirrors evaporated. Together with the instruments and the most important touch functions, these virtual mirrors form part of the clear panoramic information arc spanning the cabin front below the windshield. The interior rearview mirror remains analog, and that is a good thing. The cockpit illumination is by discreet LED strips angled towards the driver, and these provide a very cool effect when darkness falls. A leather-covered pad that includes the driving control provides hand support whilst operating the lower touch functions. So far this is the most convincing touch concept you can reasonably use whilst driving. The black backgrounds of the dual touch screens minimize reflections and driver distraction, while Audi has introduced haptic feedback for the large, virtual easy-to-hit-on-the-move buttons that utilize a similar operating technology to the home button on the iPhone 8. Meanwhile, certain functions are still accessed via conventional buttons and knobs, our favorite being the Volume control for the audio system. Importantly, the hazard warning lights are also operated by an easy to find touch button. As expected Audi has developed a usable voice control module, but a demonstration was not part of our test ride in this prototype. That said, what the engineers described to us implied that it works in a similar way to the MBUX system in the new Mercedes A-Class. For all this innovation Audi seems to know when to stop short of crossing that fabled bridge too far. Compared to Tablet PC in cars like as the Tesla Model 3, the new Audi MMI seems almost conservative and proves that Audi does evolution rather than revolution where necessary, respecting the fact that paying customers are not all PlayStation junkies. 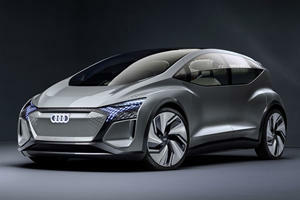 Once again Audi uses the 3D sound system jointly developed with Bang & Olufsen and Fraunhofer. Enhanced by the Fraunhofer Symphoria algorithm, this system made its debut in the current Audi A4 and then rolled out in the A8, A7 Sportback, and A6. We had the opportunity to experience this essentially touch screen-based system on the road in Copenhagen, albeit from the passenger seat. There is no doubt that the mix of engine noise and the environment whizzing past stimulates this petrolhead, and is also in the DNA of every car enthusiast. Remove this aural input and suddenly you realize how many environmental noises the sound of a combustion engine masks in a moving vehicle. Our past experiences with electric cars have always seemed at odds with their lack of engine noise because the rolling noise of tires on tarmac becomes all the more heightened. The theme here is not just in-car entertainment, but also the entire staging of electric driving as a near-silent aural experience. It was thus pleasing to note that Audi has gone to great lengths to banish any intrusive external noises from the e-tron cabin. For starters, the electric motor transmission unit positioned in the center of the multi-link rear axle features elastic mounts to reduce mechanical vibrations, while the sub-frame is decoupled from the bodyshell by bespoke rubber bushes. Similar sound and vibration isolation measures have been taken with the electric motor that drives the front axle. It all seems to work as advertised, and the Audi e-tron starts soundlessly and remains extremely quiet even under the full acceleration sprint that Rupert Spielvogel, the man responsible for the cars user interface, was happy to demonstrate. Instead of the “electric-tram-at-speed” sound made by the Tesla and other electric cars, the e-tron merely generates a distant whistle, even under full power. The counterpoint is a distinct absence of the noises required to warn errant pedestrians from crossing in front of this electric car. Audi say they have the issue in hand, but no external noise-generating device was installed on this prototype. Where you would expect to find the motor under the hood of a normal car the e-tron has no additional luggage compartment, only a flat shelf with a compartment to house the charging cables. On that score, thanks to Audi’s bespoke double-sided charging bays, the e-tron is also set to gain a head start in the charging station race. We were told that their 150 kW fast-charger takes 30 minutes to deliver an 80-percent charge good for up to 248 miles of normal driving. The Audi e-tron’s near silent cabin allows Bang and Olufsen's premium 3D sound system to show its full potential at both city and highway speeds. The acoustics team, led by Wolfram Jähn - who was also responsible for the sound system in the new Audi A8 - focused on extending spatial representation and populating the soundstage with the highest levels of aural detail. The Bang & Olufsen premium 3D sound system in the Audi e-tron provides a big sound show, its 16 speakers able to deliver speech and music without the handicap of mortal combat with a growling combustion engine. In fact, the system does not have to fight rolling noise either, and our tour through Copenhagen showed just how effective the acoustically insulated wheel arches are as road noise filters. What remains is pure audio akin to what you might experience at home in your living room. Output from the 3D speakers positioned high in the A-pillars and the center-speaker reflecting off the windscreen significantly increases the soundstage in the vertical plane. Even applause during live recordings sounds quite authentic. The 3D sound effect can be tailored to individual preferences in three steps, while a virtual slider on the Touch MMI’s 7-inch OLED display allows you to continuously adjust the surround effect. From the passenger seat some discoloration in the vocal bandwidth, and glitches in image stability detracted from a totally convincing audio experience. However, it is important to remember that this car was a prototype, and high-end car audio systems are often optimized with more bias towards the driver regardless of the selected setup. Audi says the system benefits greatly from the symphonic algorithm B&O developed in cooperation with the Fraunhofer Institute in Erlangen. This calculates the information with semantic abilities to distinguish between direct sound and spatial components from stereo or 5.1 recordings in the third dimension and prepares them for the 3D speakers. The low-midrange drivers of the 705-watt B&O system are housed in their own enclosures and integrated into the front doors. This creates the best conditions for controlling bass frequencies while shielding the output of the speakers from the environment. This has the added benefit of keeping conversations private when you are making a hands-free phone call. The deep bass frequencies are the responsibility of the bespoke 200mm diameter dual voice coil subwoofer built into a narrow and rugged integrated package at the back of the trunk. While low frequencies are omnidirectional and more tolerant of background noise there was no question that the absence of road noise allowed our ears to detect the nuances this high quality powered sub-woofer is able to generate. As with a good home audio set-up the quiet environment also mercilessly revealed the variation in quality of low-frequency reproduction across the music test tracks stored on the hard disc. Our short city tour of Copenhagen from the passenger seat was far from enough for a proper judgment of the forthcoming e-tron, but it certainly whetted our appetite for more, which is exactly what Audi intended. Watch this space for the next chapter in the e-tron story. 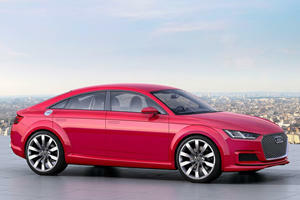 Audi A3 Liftback Could Be Instead Of Rumored Four-Door TT? Forget a TT four-door. 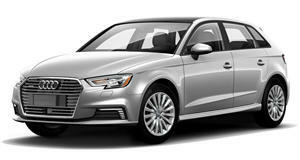 An A3 liftback is far more likely. That's about a fifth of its profits from last year.